quickly staged large scale protests against the food at one of San Francisco's trendiest hot-spot dining experiences. They told us they had been to Frisson a week earlier and that they found the food portions small, unsatisfying and extremely pricey. They did reiterate, however, that they thought Frisson's drinks and bartender were excellent and advised us to try it out another time just for the good cocktails. little more filling than sushi. 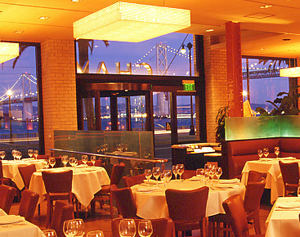 Nestled in a row of Restaurants on the Embarcadero, Chaya has great views of the Bay Bridge, plus live jazz on a Sunday night. We had no problem securing a table at short notice even though it was busy and lively. Parched after our six or so block walk, we swiftly ordered a round of Chaya House cocktails at $9 each. The girls were both seduced by the thought of Bellinis whilst the boys appeared to be in more Cosmopolitan moods. The Bellinis, reportedly made correctly with Italian sparkling wine, Prosecco, and peach puree weren't knockout. I deduced they may have been made with juice rather than puree and consequently were a little on the watery side. For an appetizer I chose a Summer Vegetable Heirloom Tomato & Buffalo Mozzarella Tart with Sweet Onion Marmalade, Olive pesto and mixed herb oil at $12,50. 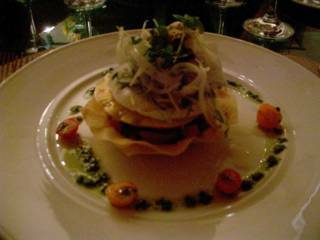 Unexpectedly, this was a cold plate, a filo pastry basket filled with all manner of textures and tastes. Roasted peppers formed the base level with the onions on top. Next layer up was one large slice of tomato covered in a similarly sized slice of mozzarella. The assemblage was crowned with a mix of shaved fennel, cresses and the pesto. The plate was dotted with cherry tomatoes and the herb pesto. This dish didn't work for me - there were just too many things going on. The extremely fresh, tomato and mozzarella just needed a little salt to draw out their flavours. They should have been the stars of the dish but the crunchy fennel dominated texture-wise whilst the roasted peppers, much as I like them, were overpowering in terms of flavour. Each mouthful tasted entirely different to the last and by the time I finished it I was completely at a loss to define what I had eaten. F described his warm Crispy Goat Cheese Salad ($10.50) as good but he didn't believe the menu's description of the red wine vinaigrette it was dressed in. He claimed the dressing tasted more oriental. When I told him it was meant to be 'red wine' he exclaimed "well then it must be American red wine". That's the French for you. H let me try a forkful of his Sauteed Sonoma Foie Gras over French Toast Brioche with roasted apple, rhubarb salad and cassis sauce at $16. Wow, this appetizer was startling good. The ultimate comfort food, but so rich I think the one tiny mouthful I tried was enough to satisfy the more needy side of my personality. For my entree I was uhhmmming and aahhing for a while before choosing, at the very last moment, Pan-Roasted New Zealand John Dory with Day Boat Sea Scallops, celeriac puree, kale, maitake mushrooms and a black truffle champagne sauce at $27. The fish was succulent, tender and perfectly cooked. I couldn't even find the celeriac (that's celery root in US-speak), which was a great shame as it is one of my favourite vegetables. The kale was tough and tasted so much of the colour "dark green" it had no right to be on the plate. It added nothing to this otherwise delicate dish. The mushrooms were fine, and the sauce was creamy, moreish and perhaps a little overpowering. It certainly dominated everything it came in contact with. F had settled for an Oak Wood Grilled Black Angus Rib-Eye Steak with Three Peppercorn Sauce, Roasted Potato, Sweet Onion, Romano Beans, Veal Jus & Fresh Basil, $31. I asked him to describe it in his eloquent French manner. The meat, he told me, was standard. He ordered it medium but felt it was a little overcooked. He wasn't keen on the greasy fatty pieces surrounding the flesh and said he could discern no pepper whatsoever in the three peppercorn sauce. The potatoes which were so small with red and black skins, that they resembled a trio of grapes, were his least favourite. "Crap, dirty and mouldy" were the three generous adjectives that summed up his description of them. He had some good things to say about the "crusty nice beans" but would have preferred a "big plate of French Fries" to accompany his meat. H chose the Two Way Lamb - Roasted Chop and Braised Leg with Caramelized Fennel, Baby New Potatoes and Rosemary Jus, $29. He loved the chops, and I agree they were delicious as he let me try a mouthful, but he was less enamoured of the braised leg which he claimed was "a little bit weird". 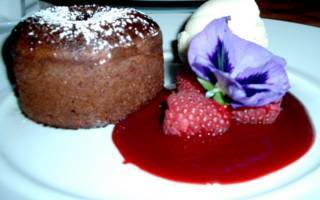 For dessert, F and I both wanted to try the Molten Chocolate Cake - Warm Valrhona Chocolate Cake, Raspberry Coulis, Tahitian Vanilla Ice Cream, $9, so we elected to share. It was ok, we were both in need of chocolate so it suited our needs. The cake was well-baked with a hot steamy centre and a runny chocolate lava that flowed over the plate once we had cracked it open, mixing with the fruit puree. My criticism would be that it was a little too sweet. Had the chocolate been more bitter and the raspberry more sharp this dessert would have ended up one step closer to heaven. 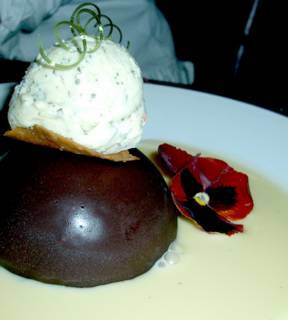 J and H chose to share the Mint Chocolate Bombe, filled with icecream, $9. They must have really liked it because they wouldn't let us try, even a spoonful. We washed down our food with a really wonderful bottle of Etude Pinot Noir ($70), chosen by H. Good choice, H, and Bon Voyage, good luck in Canada! I really am not overly enamoured of Chaya, especially because the bill on both occasions I have been there has ended up being way higher than the food experience that accompanied it. there's also a couple chayas in l.a. -- including one in WeHo. they're swank. i always think of them as date places, but i'd have to agree with your assessment of the food. the combinations sometimes don't make sense, and it's all an expensive experiment. i did have sushi there in the bar area one night, and it was all quite nice & fresh. i was with some major sushi-heads, and none of them complained. i, like fred, have also gotten the rib eye there. unspectacular. it sounds like fred deserves a good steak. you can't go wrong with ruth's chris. if you're heading there or to harris', or izzy's, or the house of prime rib, give me a call... i'm down! I didn't like Izzy's? Do you? Did you try the one in Corte Madera too? I took my mum and grandma to Harris when they visited from England and we had Kobe. I was so excited about trying it that it didn't live up to my expectations. I went to Ruth Chris in New Orleans once and i seem to remember it wasn't bad. As for the House of Prime Rib...i thought it ONLY serves prime rib? Or does it do other steak choices too? F likes his fillet mignon with peppercorn cream sauce and good french fries. Would Ruth Chris be good for that? If so we might take you up on the offer some time... Other than that I remember a great fillet at the Brazen Head a few years back. That's in your neck of the woods. have you been there recently?